The outer gate and bridge of Nottingham Castle were constructed in 1250-55. Medieval masonry survives to the lower string course, the upper part is covered in modern ashlar cladding. 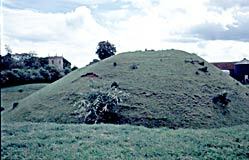 A motte and substantial ditch survive at Egmanton Castle. Newark (located at Ordnance Survey Grid Reference SK 796541): substantial stone ruins of major castle. Easy access in public park. Information panels on site and further information in Gilstrap Centre adjacent to site. Reconstruction drawings provide a vivid illustration of the castle in the later medieval period. Nottingham (SK 568395): castle museum, with some medieval finds and information, housed in ducal palace. Grounds include substantial surviving remains of medieval castle, best explored by reference to Christopher Drage, Nottingham Castle: A Place Full Royal, (2nd edition, revised with additional material by Trevor Foulds), Nottingham Civic Society/The Thoroton Society, 1999. Easy public access. Greasley (SK 490470): disguises its medieval remains within later farm buildings but still possesses substantial standing sections of a ground floor hall open to the rafters with quality moulding around its great arched doorway and fine late 15th-century T-shaped window. Evidence for most of the castles mentioned above can be clearly traced on the ground by using a grid reference (found in D.J.C.King, Castellarium Anglicanum, 2 vols, 1983) and the relevant Ordnance Survey Landranger or Explorer map. Laxton (SK 720676): substantial earthwork remains of motte and two baileys. Easy public access. Worksop (SK 593798): impressive earthwork platform forming central feature of a public open space. No information available on site. The following sites are clearly visible from public roads or footpaths: Aslockton (SK 509518), Bothamsall (SK 671732) and Egmanton (SK 735690). Cuckney (SK 566714) surrounds the parish church and can be explored via the churchyard and its extension. Most other sites are on private land or are more difficult to find. Please always seek permission before entering privately-owned sites. Archaeological remains survive for all known castle sites in Nottinghamshire. These usually take the form of earthworks, some more substantial than others. Very few sites have been professionally investigated – i.e. excavated or surveyed, in recent times. Information about remains and any work conducted can be obtained from the Nottinghamshire Sites and Monuments Record. Many of the rural castles in particular sit within landscapes that have themselves been examined for evidence of medieval settlement. Laxton boasts not only its castle but also a rare surviving medieval field system (much reduced in modern times), mill mounds, fishponds, rabbit warrens, medieval church and earthwork remains of a second manorial site. Plan-form analysis suggests that the village was regularly laid-out following the appointment of Robert de Caux, the lord of the manor, as keeper of the Royal Forests of Nottinghamshire and Derbyshire in the early 12th century. The castle seems to have been expanded in size following this appointment. Egmanton sits within ‘Le Clay’, the pre-1227 forest area in Nottinghamshire to the east of Sherwood. The village is close both to the navigable Trent and to a major route north (The Great North Road at Tuxford). As at Laxton, the castle is set back from the village plots, just north of an elongated crossroads that may represent the former village green or an unrecorded market place. The crossroads link the village to its four neighbours: Laxton to its south, Kirton to its west, Normanton on Trent to the east, and the market village of Tuxford to the north. The castle occupies the north-east segment of this area, protected by the gentle curve of the road running north to Tuxford past the medieval church. Greasley castle can be found at the junction of the coal measures and the permian limestone on the Nottinghamshire-Derbyshire border. It is a huge embanked enclosure some 400metres by 250metres embracing an impressive complex of fishponds, pasture, the medieval castle itself an an 18th - century farmhouse. The underlying geology has impacted upon settlement and construction patterns. The post-medieval buildings are mainly brick and on the coal measures whilst the castle is built of limestone from the Quarry Woods at nearby Bogend. The limestone areas provide the lighter soils for arable whilst the predominant heavy clays are used for cattle pasture and woodland and must contribute to the local norm of dispersed settlement. The castle sits on a south-east facing slope overlooking the Gilt Brook and just below the parish church. It has no fewer than 18 springs along its frontage. 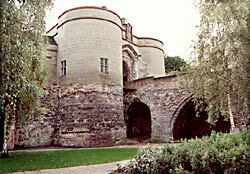 Every Nottinghamshire castle can usefully be related to medieval settlements and to settlement development. Many sit in close proximity to a parish church, indicating a shared role in local leadership.